The results of European Bioplastics’ annual market data update, presented recently at the 10th European Bioplastics Conference in Berlin, confirmthe positive growth trend of the global bioplastics industry. “The market is predictedto grow by more than 350% in the mid-term,” says François de Bie, Chairman of European Bioplastics. The data compiled in cooperation with the Institute for Bioplastics and Biocomposites (IfBB ) of the University of Applied Sciences and Arts Hannover, Germany; and Nova Institute in Hürth, Germany, show that the global bioplastics production capacity is set toincrease from around 1.7 million tonnes in 2014 to approximately 7.8 million tonnes in 2019. Biobased, non-biodegradable plastics, such as biobased PE and biobased PET, are the main drivers of this growth. More than 60% of the bioplastics production capacity worldwide in 2014 was biobased, durable plastics. This share will increase to over 80% in 2019. 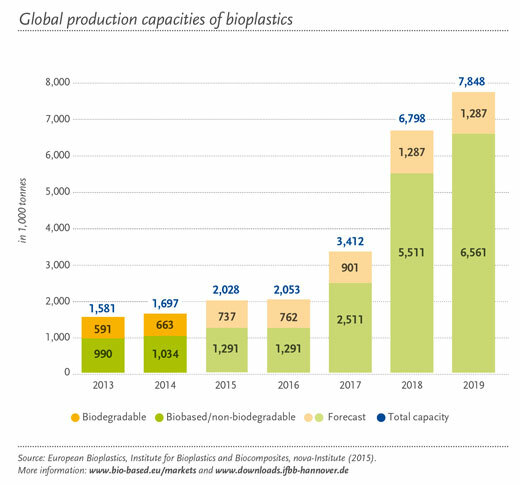 Production capacities of biodegradable plastics, such as PLA, PHA, and starch blends, are also growing steadily, nearly doubling from 0.7 million tonnes in 2014 to well over 1.2 milliontonnes in 2019. PHA production will double by 2019 compared to 2014, due to a ramp-up ofold and new capacities in Asia and the US. “It seems that compostable plastics are moving from niche to mainstream and many compostable plastics have found their true added value applications,” explains de Bie. Packaging remains the single largest field of application for bioplastics with almost 70% (1.2 million tonnes) of the total bioplastics market. Due to the excellent fit of bioplastics in thepackaging market, this number is expected to increase to more than 80% (6.5 milliontonnes) in 2019. “The data illustrates an important trend to make packaging more resource efficient, which is driven by a growing consumer demand for products with a reduced environmental impact,” explains de Bie. The data also confirms a decisive increase in the uptake of bioplastics materials in many other sectors, including textiles, automotive applications, and consumer goods. The land used to grow the renewable feedstock for the production of bioplastics amounted to approximately 0.68 million hectares in 2014, which accounted for only 0.01 percent of the global agricultural area of 5 billion hectares, 97% of which were used for pasture, feed, food, other materialuses, bioenergy, and biofuels. This clearly shows that there is no competition between the renewable feedstock for food, feed, and the production of bioplastics. With a view to regional capacity development, Asia will further expand its role as major production hub. In 2019, more than 80% of bioplastics will be produced in Asia. Europe will be left with less than 5% of the production capacities. Whereas countries such as the US, Asia, and Latin America are implementing close-to-market measures to attract production hubs and promote faster market development, the European market for bioplastics is limited by the lack of economic and policy measures to allow for a larger scale-up of production capacities within Europe. “Against this background, the implementation of a European policy framework that secures equal access to biobased resources, creates measures to facilitate market entry for biobased products, and accounts for the facilitating role of compostable plastics for efficient wastestream management, is of paramount importance. We urge EU legislators to consider and make efficient use of the immense environmental, economic growth and job creation potential of our industry in the forthcoming Circular Economy Package,” concludes de Bie.